PT Indosat Tbk - Indosat or known as "Indosat Ooredoo" is a reputable cellular company in Indonesia. Indosat Ooredoo is recognized as one of the largest cellular operators in Indonesia and positioned inside the top three of cellular operators in Indonesia. As at the end of June 2017, Indosat Ooredoo maintains 96.4 millions of total active cellular subscribers. Indosat Ooredoo is a local member of global telecommunication services provider from Qatar Ooredoo Group (previously known as Qatar Telecom). As today, Indosat Ooredoo is 65% owned by Ooredoo Group through Ooredoo Asia Pte Ltd. Another 14.29% are owned by the Government of Indonesia (14.29%) and public (20.71%). According to PT Indosat Tbk Corporate Presentation 1H 2017 as quoted by JobsCDC.com, Indosat Ooredoo has shown significant performance improvements in the first semester of 2017 (1H 2017 - ended in 30 June 2017). Indosat Ooredoo managed to record total consolidated revenue of Rp 15,112 billion in 1H 2017. This number is up 8% from Rp 13,942 billion in 1H 2016. Referring to its presentation, total profit attributable to owners of the parent increased from Rp 428 billion to Rp 784 billion. Minimum D3 in any field with minimum GPA of 2.75. Familiar with Smartphone and Social Media. Have a good voice quality and active in English language. Good personality and good looking, positive and eager to thrive. JobsCDC.com now available on android device. Download now on Google Play here. Please be aware of recruitment fraud. The entire stage of this selection process is free of charge. 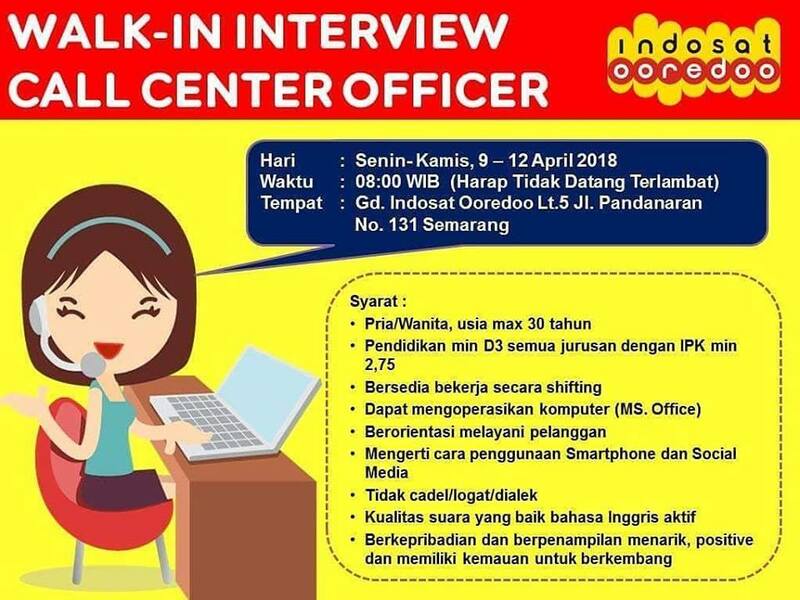 PT Indosat Tbk - Walk in Interview Call Center Officer Indosat Ooredoo April 2018 will never ask for fees or upfront payments for any purposes during the recruitment process such as transportation and accommodation.